Today I set a goal for myself to figure out a way to search for files in my PDM Pro vault from the command line. It is true that I can start the search tool from the command line. (<install dir>\search.exe), but I wanted something faster. 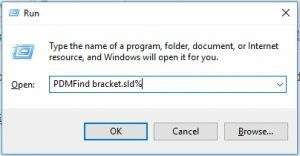 I just want to type the command and a file name, hit enter, and have my file appear in Windows Explorer right before my eyes. I certainly could create an application with Visual Studio, PDM Pro has a very nice API, but I wanted something lighter…and something that would maybe give you some ideas of other things you could quickly do from the command line. msgbox strFileName & " not found"
msgbox "Incorrect number of arguments"
Then I saved this file as “PDMSearch.bat” in my “InflowScripts” folder. …a little shorter. 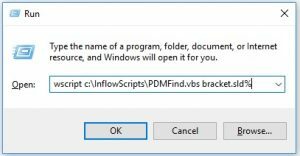 After I added the folder “InflowScripts” to my windows PATH environment variable, this if finally pretty useful!